A new fad is sweeping though the entire Western world. From America to Australia, people are frothing at the mouth to take part in it. No, it’s not fidget spinners. It’s statues, or more specifically, the destruction of statues. 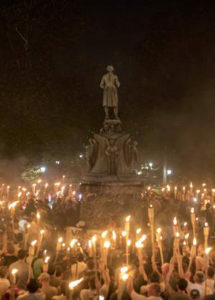 It started with the Confederate statues in the US, honoring our brethren fallen long ago who fought for a cause they believed in (states’ rights, that is, not slavery). “They’re symbols of racism!” shrieked the establishment Left. And so they set about tearing them down, either in a organized fashion conducted by some government entity or by rabid mobs of antifa who appeared to get some sort of perverse satisfaction from repeatedly kicking chunks of stone. Meanwhile, the opposition insists that these statues represent our history, and tearing them down is tantamount to erasing history, which is a position to which I expect readers of this site to be more sympathetic. However, I would argue that there is something much more sinister at work in this sudden full-scale assault on historical monuments. These statues are physical representations of the stories of our nations and the people who played major roles in them. These are our heroes. They are the main characters in what I call “true hero narratives.” A true hero narrative boosts the morale of the people. It helps to create a common heritage and culture that binds a community together. The hero is celebrated for loving and sacrificing for his people, so that they might have a better future. Every culture needs hero narratives. They create a cohesive national identity. These narratives are almost never true, but that is not their point. The point is that the narrative functions as the glue of society, providing a shared cultural and historical context for everyone in a particular in-group. As this narrative is destroyed, you will see less social cohesion, less social trust, and more conflict. There’s an idea that historical statues should be educational and thus should reflect an accurate history. Someone suggested recently that there should be plaques on all such monuments detailing each atrocity the person in question had committed to balance out any hero worship. First of all, statues are not actually educational. What can you learn about history from looking at a statue? There is usually very little information, other than names, dates, and perhaps a brief description of an event. Statues aren’t there to give people a history lesson. They are there to sum up, in physical form, the lessons of our hero narratives, so that people today can look upon them and feel a connection to the ongoing national story. Secondly, accurate history is, frankly, not for the masses. Critical thinking is unfortunately beyond the reach of too many people to allow us to base effective cultural narratives on truth. A hero narrative need not be truthful in order to have meaning. It only matters that people believe that the hero was fighting for them, whether it was Abraham Lincoln or Robert E. Lee. Finally, I don’t believe for a second that the Left-wing agenda of destroying statues has anything to do with telling the truth, anyway. It is purely about demoralization. The sole purpose of this movement to destroy the statues of “heroes” is to sever people’s ties to their culture and history. People who lose their ties to their cultural narrative are much more accepting of globalist agendas because they don’t feel like they have anything sacred in their own culture that is worth fighting for. Multiculturalism? No problem. I’ve got no culture of my own to preserve anyway. Open borders? Sure, my country doesn’t have anything worth protecting. Cultural Marxism? Why not? I have no values worth standing up for. And on and on it goes. How many times have you heard an American say he doesn’t have a culture? It’s a symptom of an underlying problem, and a dangerous one at that. What happens when a hero narrative is destroyed? It creates a void in a person, eager to be filled. People need narratives. We all live our lives by them. They provide a sense of community and belonging. Thus they ought not be dismantled on a whim. There is a bigger picture here that most people miss. It’s not about the statue itself. It’s about what it represents in the hearts and minds of people. Tearing down a statue isn’t about being honest about history; it’s about tearing down a people’s shared heritage in order to demoralize them. We are already suffering from a lack of heroes. We have been subjected to generations of demoralization. Our connections to our ancestral heroes are already weak, making it harder for people to connect with what these statues represent. However, it is in just such times of desperation, when our connection to heroes is the weakest, that we need our heroes the most.